A study on sheep foraging behaviour was conducted under the RBG's Community-Based Rangeland Rehabilitation (CBRR) programme in 2009 and 2010, to gather information that will help develop grazing management procedures. 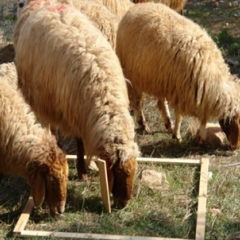 Specific grazing procedures are necessary so that forage resources at the Royal Botanic Garden site, and other locations in Jordan, can be sustainably utilized. Without a specific plan, unmanaged grazing can result in excessive grazing at inappropriate times, which in turn can lead to a decline in forage production and potential harm to established shrubs. The grazing behaviour study was conducted at the RBG site during the four seasons: winter (January), spring (April), summer (June) and fall (September). A small flock of approximately 25 Awassi sheep, between 3 and 5 years old, grazed in a small enclosed paddock measuring roughly 0.1 ha, or 1 dunum. They were allowed in for 2.5 hours in the morning for three days. The activities of the sheep were classified into six major categories: (a) grazing grasses, (b) browsing shrubs, (c) chewing, (d) rumination, (e) standing and (f) resting. The results of the study will soon be published in a full report. The RBG intends to be an ongoing demonstration site for grazing research and management.